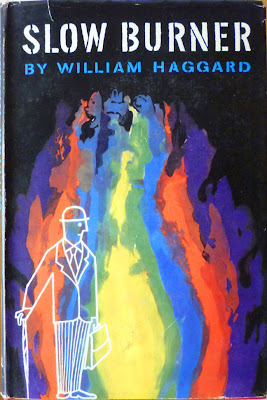 Slow Burner was first published in hardback in the UK by Cassell in 1958, under a vibrant but sadly uncredited painted dustjacket. 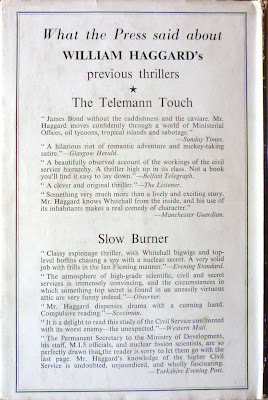 As already mentioned, I reviewed the novel itself yesterday, the story of which involves skullduggery surrounding a top secret nuclear fission process. 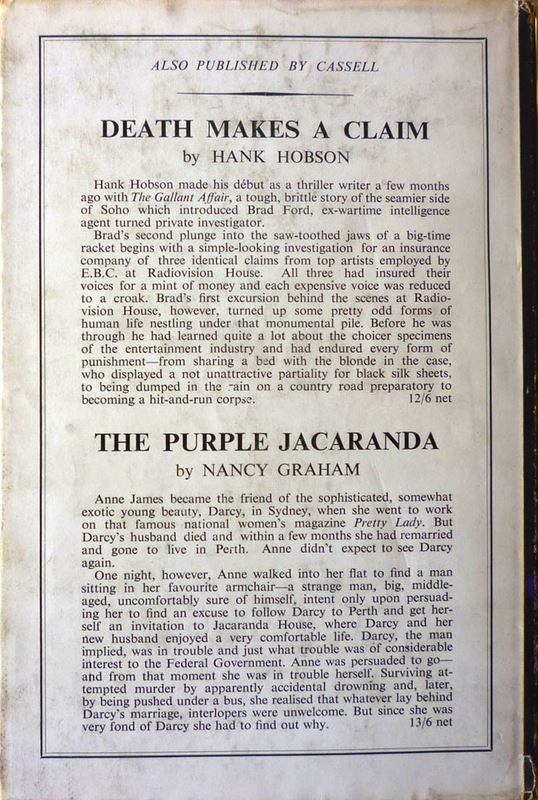 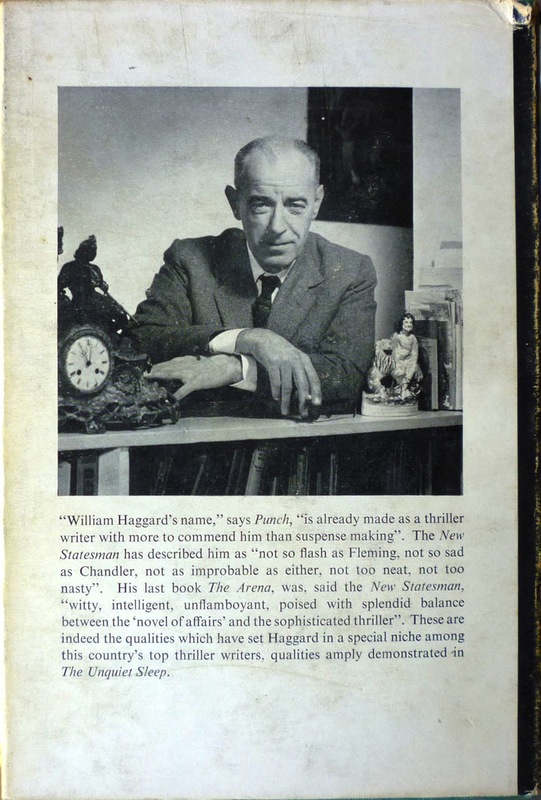 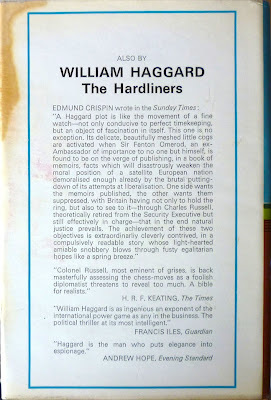 Haggard's early novels can usually be found fairly easily in paperback, but hardback first editions are sometimes not so common; AbeBooks, for example, currently has just five copies of the Cassell first listed, but of those, three are sans jacket, another is ex-library and in New Zealand, and the last is also in New Zealand. 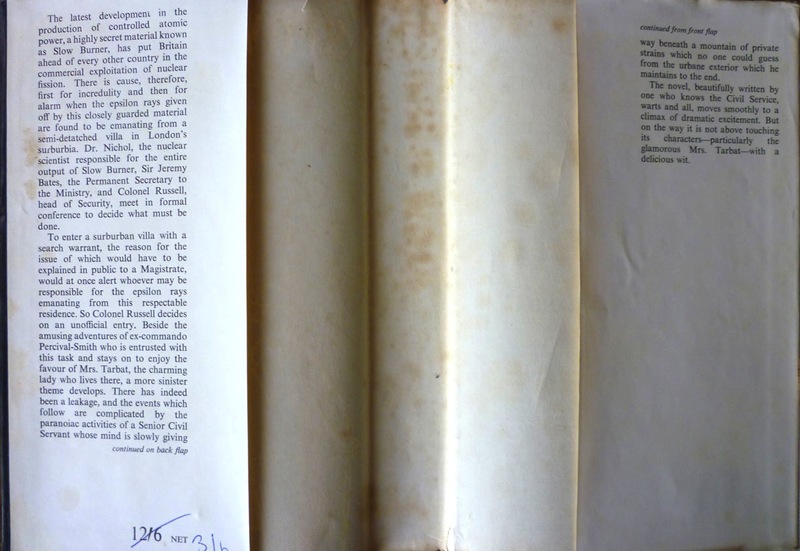 You might have a bit more luck on Amazon Marketplace... but then again, you might not. 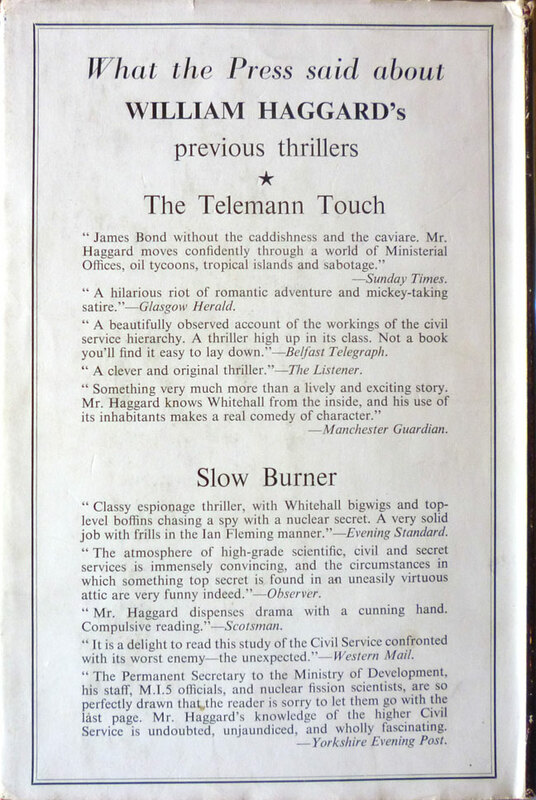 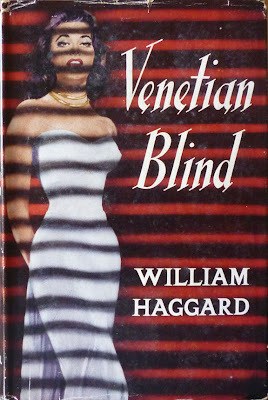 The UK hardback first edition of the second Colonel Russell thriller – and Haggard's third novel overall, following 1958's The Telemann Touch – Venetian Blind, published by Cassell in 1959. 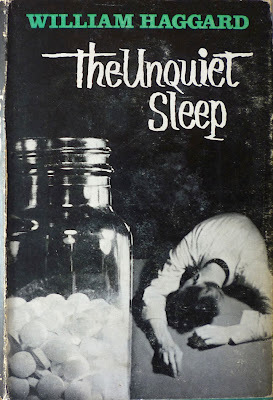 Once again the dustjacket illustration is uncredited, but at least copies of the first edition are a bit more readily available than Slow Burner: there are currently twelve of 'em on AbeBooks, in various states of disrepair. 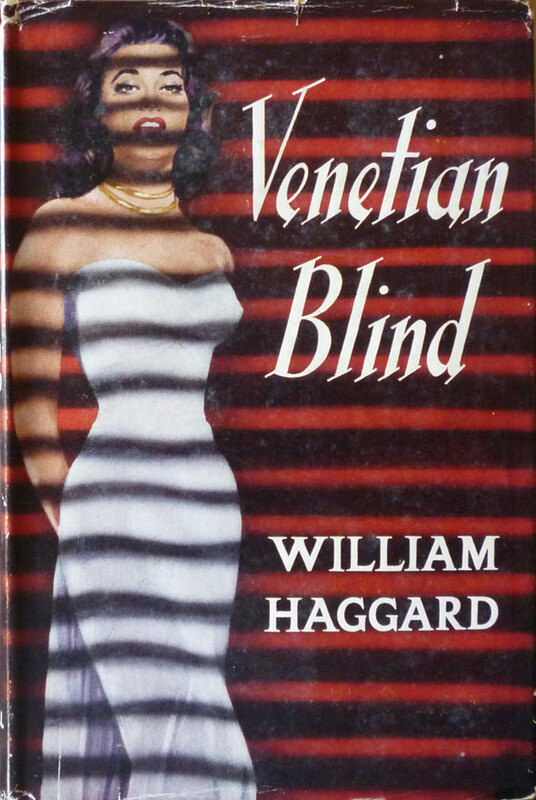 The story this time centres on Negative Gravity; check out the Charles Russell dedicated page on Spy Guys & Gals for more on Venetian Blind, and indeed on all of Haggard's Russell novels. 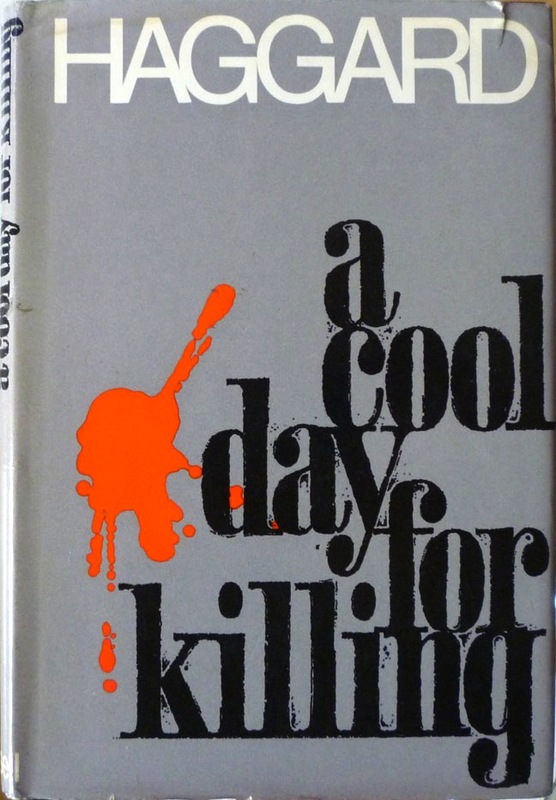 The UK hardback first edition of A Cool Day for Killing, published by Cassell in 1968. Quite a minimalistic dustjacket design on this one, and for a change it's credited, to one Brian Roll. 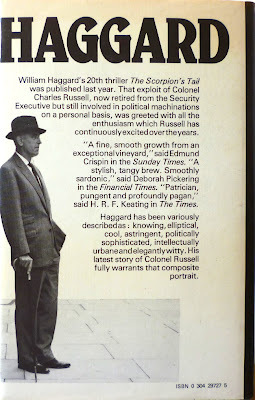 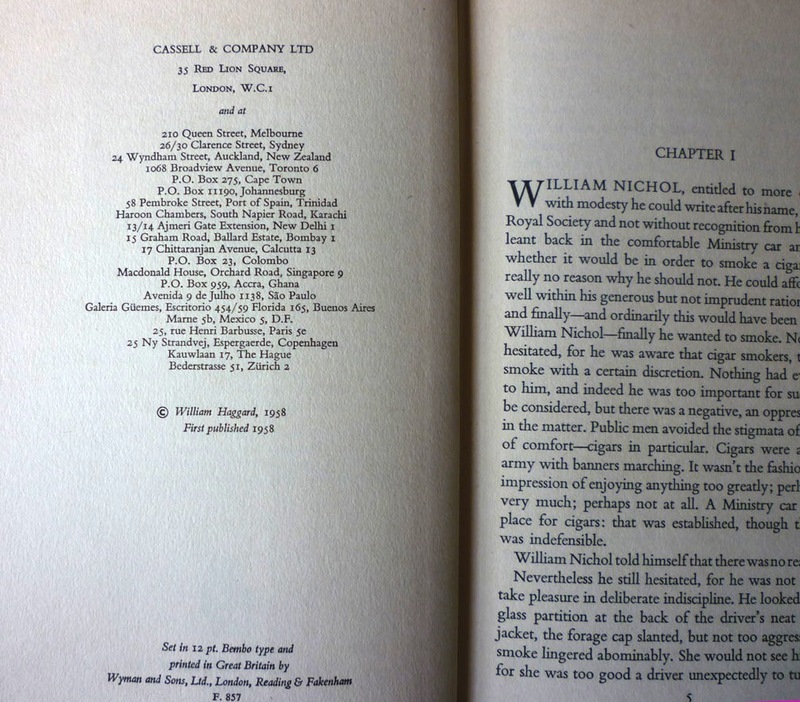 The twelfth Charles Russell thriller, this one sees Colonel Russell protecting the daughter of a Malaysian Sultan, and is notable for being the final novel with Russell as head of the Security Executive; he was destined to retire in the next book, The Doubtful Disciple (1969), but would continue to assist the Executive in an unofficial capacity. 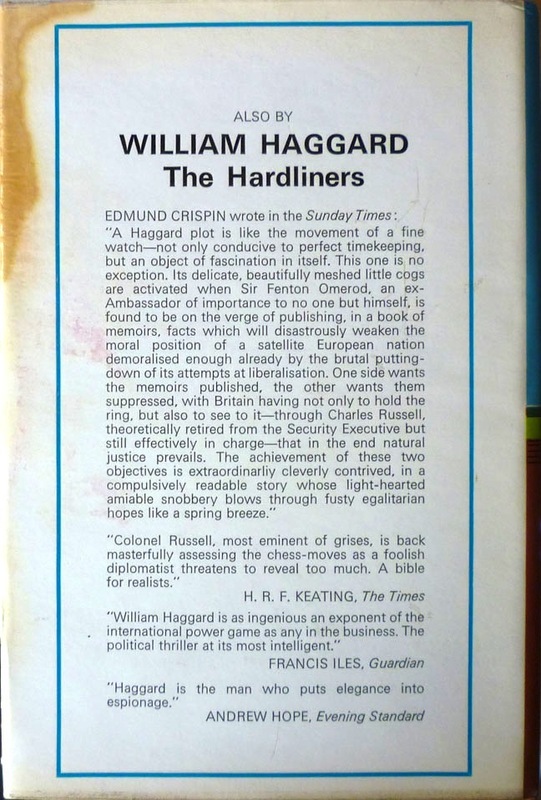 Interestingly (er, possibly), by this point in the series (nearly midway), Cassell no longer felt the need to have the author's first name on the cover; he'd simply become Haggard (so to speak). 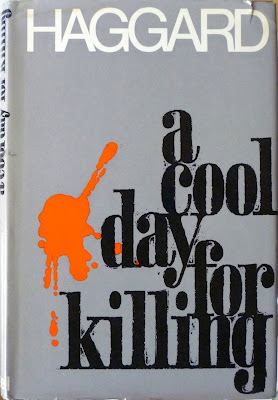 Plenty of copies of the Cassell first of A Cool Day for Killing on AbeBooks: over twenty at present. 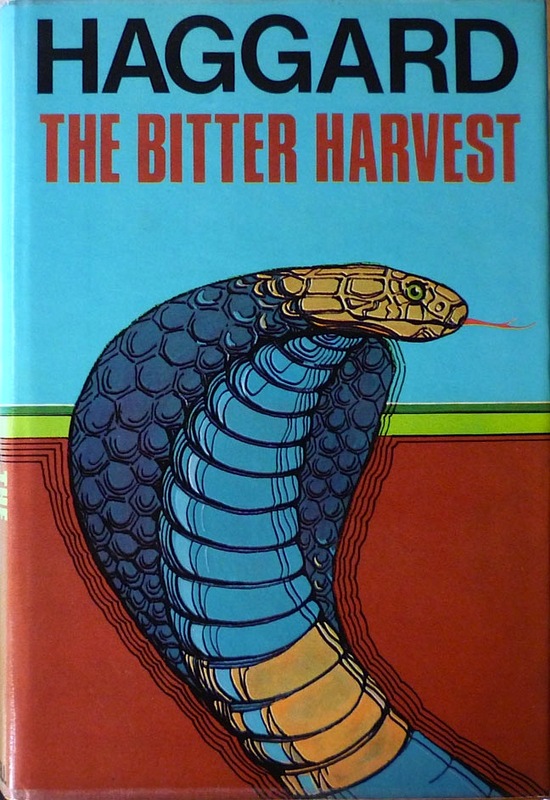 This is the UK hardback first edition of Bitter Harvest, published by Cassell in 1971. The fourteenth Charles Russell adventure, this one sees the good Colonel brought out of retirement to tackle rising political temperatures in the Middle East. 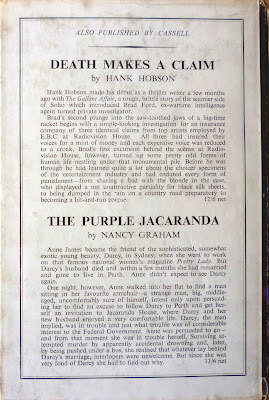 The jacket design is by Brian Hampton, and once again there's a plentiful supply of first editions on AbeBooks. 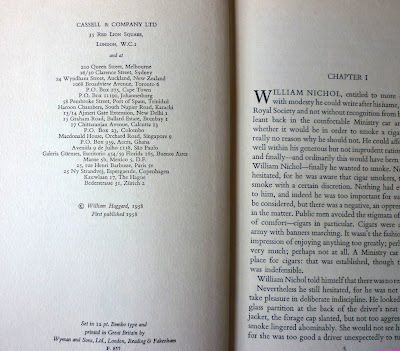 Bitter Harvest was retitled for its US publication – by Walker, in 1971 – and was known instead as Too Many Enemies; the subsequent Russell novel, The Old Masters (1973), was also retitled by Walker in the States, this time as The Notch on the Knife. 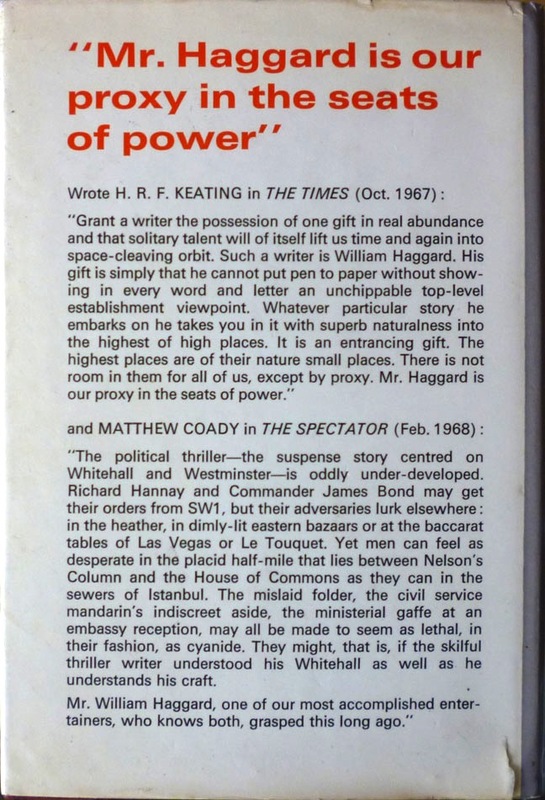 Fascinating stuff, eh? 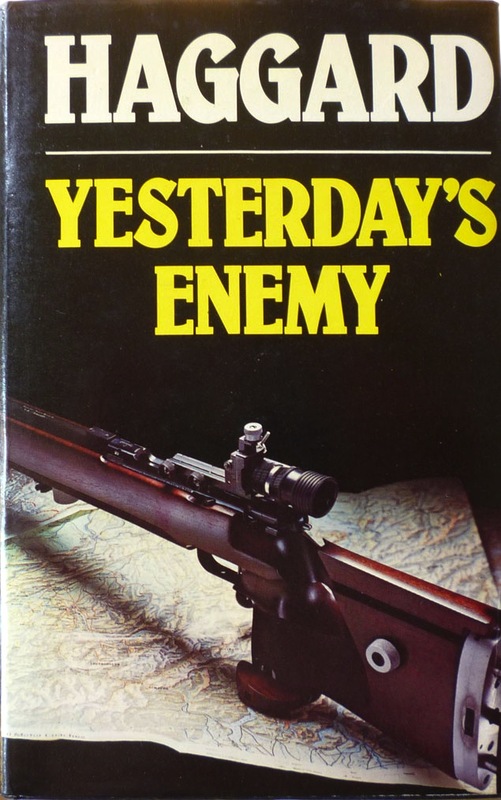 The UK hardback first edition of Yesterday's Enemy, published by Cassell in 1976. 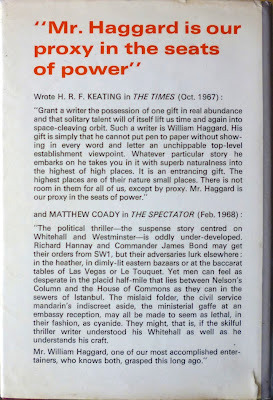 I bought this for a few quid in the Albion Bookshop in Broadstairs, Kent, again during my summer holiday, but it's readily available on AbeBooks for around a fiver. In this one, Colonel Russell has to deal with a vanished nuclear physicist and the threat of a secret nuclear weapon. 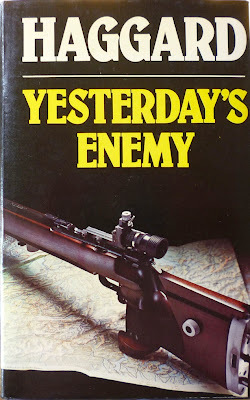 The front cover photo is by Mick Wells, and is a fine example of the kind of Raymond Hawkey-esque "artfully arranged weapons" photographs prevalent on British dustjackets in the 1970s. Great shot of Haggard on the back there, too.